I always thought I was the last person who would become a vegetarian. Yet more than a year ago, my family decided to become vegetarian. How did this happen? For most of my life, I’ve had numerous reasons for resisting the idea of giving up meat and fish. Like most Americans, my parents raised me in a meat-eating household, and I always enjoyed eating most kinds of meat and fish. Despite growing up in a liberal community and being left-leaning, I always thought vegetarians (and especially vegans) were too extreme and a bit hippy-dippy. Over my life, I’ve developed numerous food sensitivities, and I could not imagine further restricting my diet to either vegetarian or vegan. Milk or lactose are everywhere in processed food ingredients. First, while I college, I became severely lactose intolerant. I ate a nearly dairy-free diet for almost twenty years until I discovered a probiotic which was a “magic pill” that allowed me to consume unlimited milk products. After years of deprivation, I enthusiastically returned to consuming dairy products of all kinds. 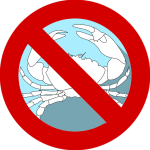 Shellfish is the most common adult-onset allergy. In college, out of the blue, I also developed a digestive allergy to shellfish; I quickly learned that shellfish allergies often don’t develop until adulthood. On top of all this, I have an uncomfortable digestive reaction to bell pepper (whether I eat it directly or eat something which contains it as an ingredient). Finally, I have some degree of sensitivity to whole wheat, especially if I eat too much of it. With all of these limitations, the last thing I wanted was an even more restrictive diet. Who or what planted the seeds of change for me? Our journey started when my daughter, who was a tween at the time, discovered PETA (People for the Ethical Treatment of Animals) and other animal welfare groups through her social media apps. She was already an animal lover and had been pleading with us for years to get some pets (we finally got cats almost three years ago). After watching some gruesome videos about livestock treatment on her phone, she told us she wanted to become a vegetarian. Sadly, at the time, we discouraged her. In addition to my personal resistance, my son (one grade younger than my daughter) had no enthusiasm for the idea. My wife was open to the idea (she grew up on a North Indian diet which included some chicken and fish but mostly emphasized veggies). However, she didn’t want to take on the logistical complications of planning and preparing meals for two different diets. My daughter tried to eat vegetarian for a couple of weeks, but without our support, her effort did not last long, and she resumed the “normal” family diet. She also loves hamburgers and was not sure she wanted to give them up. However, less than a year later, around the first half of 2017, my daughter got adamant again about going vegetarian. That summer, we visited Europe and went on a Rick Steves Family Tour, during which our tour guide recommended ignoring our usual food preferences and being food anthropologists in order to fully experience the local cuisine. 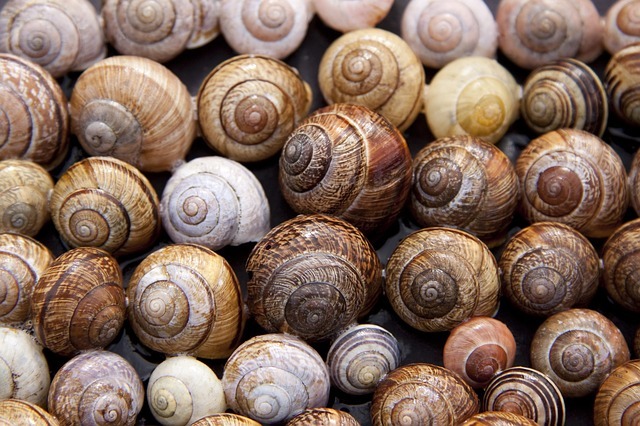 In this spirit, my daughter did try escargot in Paris, but otherwise, she stuck to her guns and ate vegetarian on the trip — which was difficult at some of the meals (where she had to mostly eat bread). Sometime after the trip, we started watching a bunch of food documentaries on Netflix, which my daughter had learned about from following animal rights groups on social media. As a family (living in the enlightened SF Bay Area at the time), we were already relatively health and nutrition conscious. We had shown movies like Fed Up to our kids (which helped us teach them that you can be unhealthy on the inside even if you look healthy on the outside). 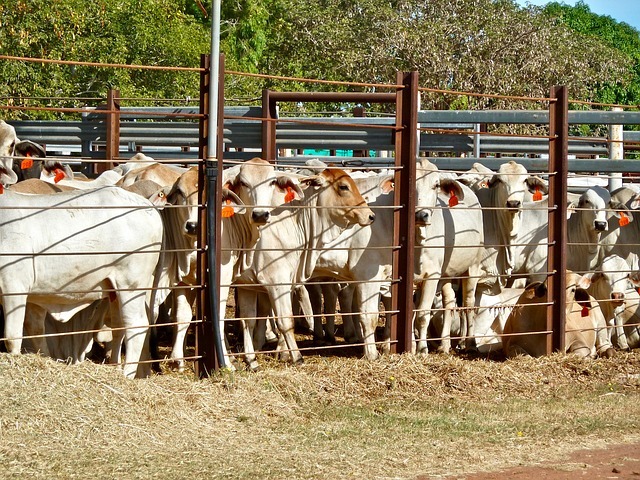 Although some of the movies above do cover the animal welfare abuses in the livestock industry, they are more focussed on the health and environmental impacts of meat-based diets. Plenty of other movies are available if you’d like to deep dive on the horrors of animal treatment in agriculture, but we did not seek those out, since we did not need as much convincing in that area. That said, seeing footage of animal conditions is far more visceral than just being academically aware of them. 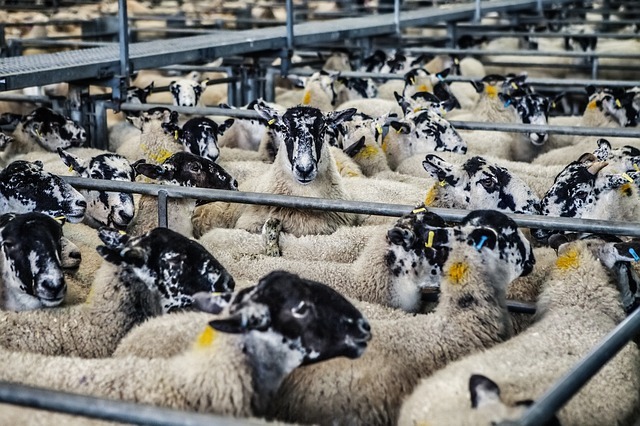 The images below are generic royalty free stock photos, so they are tame compared to what you would see at an actual factory farm (or images you might see from PETA). After watching all of these documentaries, I became aware of three core reasons to consider adopting a mostly plant-based diet. Health consequences. Most respected scientists and nutritionists (who are not in the pocket of industry) recommend a plant-based diet for optimal health. Many people with chronic diseases are able to decrease or eliminate their medications after making this change. Environmental impact. The devastation to our environment from mass scale livestock production is catastrophic and a major contributor to climate change and global warming. I also learned that, for all intents and purposes, sustainable fishing is a myth and virtually impossible. Animal welfare. The living conditions in commercial farming are horrifying, inhumane and unconscionable. I suspect most Americans are not aware of the details of how their meat gets to their table. For me, any ONE of these factors would be more than enough reason to give up meat. However, I actually resonate strongly with ALL THREE factors — which made the decision about whether to go vegetarian painfully obvious. After thinking about what we saw in the documentaries, my wife and I not only started supporting my daughter in her quest to become vegetarian, we joined her. To be fair, I consider myself a flexitarian. I eat a 99.5% vegetarian diet. However, on the rare occasion where I feel deprived or really want to taste something, I will eat meat or fish. That said, I’ve been surprised by how rarely I’ve felt these impulses. For example, as an alternative to hamburgers, veggie burgers, bean burgers or portobello mushroom burgers are a fine substitute and can be quite delicious. However, for a “real” burger hit, closer to the experience of eating beef, my daughter and I love Beyond Burgers and Impossible Burgers (high-tech plant-based burgers which simulate the taste and texture of beef and which are available at many restaurants). 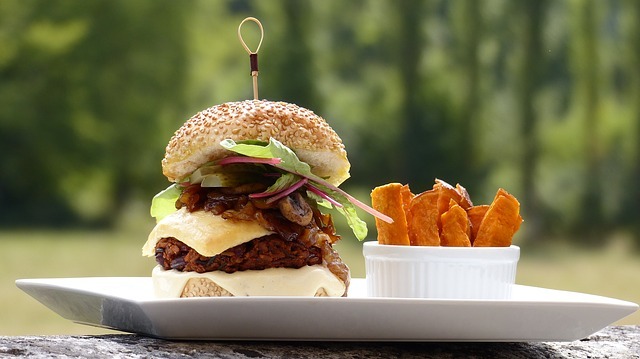 This veggie burger doesn’t actually look particularly healthful, but a traditional meat burger certainly would be a much larger detriment to the environment, to animal welfare and to your nutritional health. At home, even before deciding to change our diet, we cooked relatively little meat compared to the average American family. We occasionally baked fish, broiled sausages or brought home Costco rotisserie chicken, but many of our meals were already meat-free. The bigger change has been to our weekly routine of going out to dinner as a family. In the past, during most of these outings, we would usually order one or more meat dishes. What about now? 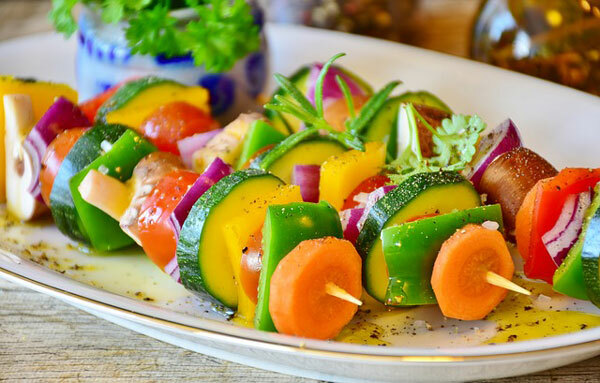 Since we prefer Mexican, Asian and Indian cuisines over American or Italian, we are usually able to find plenty of vegetarian options wherever we go. For the record, my son is still a meat eater, but he mostly conforms to the family diet and usually strays only when ordering from restaurants. I also should add that as part of our campaign to improve our diet, we not only adopted a primarily plant-based diet but also dramatically reduced our consumption of processed foods (sorry Trader Joe’s, you’ve lost some of your hold on us). My wife cooks Indian cuisine about every two weeks. 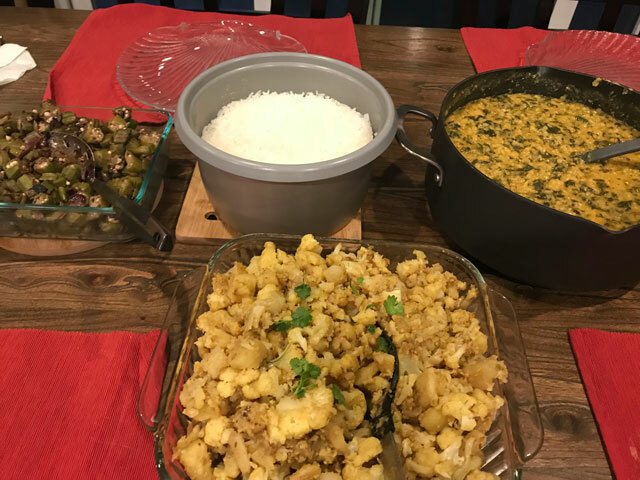 Clockwise from the upper right, this example dinner includes dal (lentils with tomatoes, onions, and spinach), potato and cauliflower curry, and stir-fried okra. Typically, we’d eat this meal with brown rice or quinoa, but this time we were having white rice for a change. We don’t want to have to be paranoid about the ingredients of everything we eat. 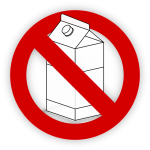 Having to scour every container for dairy or egg products would feel too burdensome and eliminate too much food. 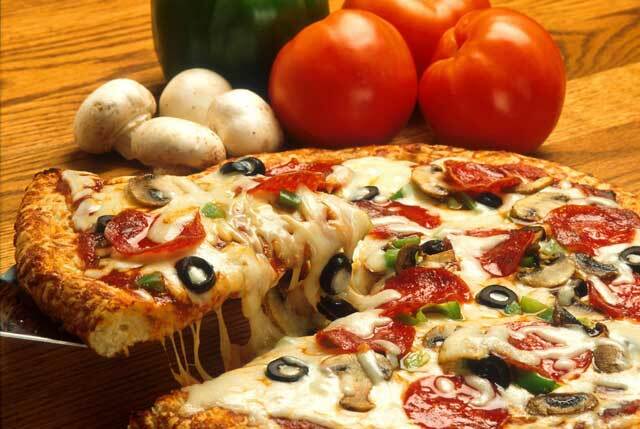 We eat quite a bit of cheese in our diet (especially when we cook Mexican or make our own pizzas). We would feel some level of deprivation were we to give up cheese. At meals and visits with friends and extended family, our vegetarianism already feels like a nuisance or imposition, so I feel reluctant to become even more extreme. Dairy-free alternatives to cheese and ice cream certainly exist, and some are quite good, but they tend to be far more expensive than traditional milk products. We are trying to avoid being too rigid or dogmatic. I think flexibility is a key to happiness in life. I also really like the philosophy: “Don’t let perfect be the enemy of good.” So far, going vegetarian feels pretty good to us, even if we are not as perfect as we could be on our impacts on health, the environment, and animal welfare. On the other hand, a member of my local ChooseFI Facebook group turned me on to a talk by Dr. Neal Barnard, who is a leading advocate of plant-based diets. Watching this video reminded me of the health consequences of consuming dairy (especially cheese) as well as the animal welfare problems inherent to milk production. As a result, my new goal is to become far more intentional about my dairy intake and consume milk and cheese products as a special treat as opposed to as a staple. I don’t know whether this step will lead me down the path to becoming fully vegan. I suspect I’ll maintain my attitude of flexibility and consider eating 95%+ clean as good enough. According to Dr. Barnard, cheese is chemically addicting (and terrible for you). I am not the first to point this out, but I see similarities and synergies between the financial independence movement and proponents of eating plant-based foods. Both communities emphasize intentionality and breaking from mindless social norms in order to achieve increased prosperity. For a good discussion of this topic, check out Vegan Path to FI (episode 90 of the ChooseFI podcast). For most of us, our physical and financial health (not too mention the environmental health of the planet) are precious resources which we need to carefully and intentionally manage. Considering statistics about obesity and savings rates in America, I’d say most of society could benefit from making some changes. I do not begrudge anyone who rejects vegetarianism, veganism, or FI principles for that matter, as long as they have educated themselves about those alternative ways of living and have made informed decisions to continue down the conventional path. 2019-02-23: Since writing this post, I watched Eating Animals. Unlike the previous movies I mentioned, this documentary does not cover any of the health detriments of eating meat and instead focuses exclusively (and horrifyingly) on how factory farming causes animal suffering and environmental devastation.